I've decided to make a cake for my husband's upcoming birthday. I've become foolishly confident in my baking abilities since I bought the three Baked cookbooks. I swear, these books have given me a false sense of being a baking goddess. I have never been a cake maker....unless the mix comes from a box. (and I've always been okay with that) But then I discovered these cookbooks and I feel like I've had an Ah ha moment. I now feel brave enough to try cake recipes. And hence my offering to make my guy a cake for his birthday. (I feel like I should have a back up cake just in case) eek! So which cake do I make him? 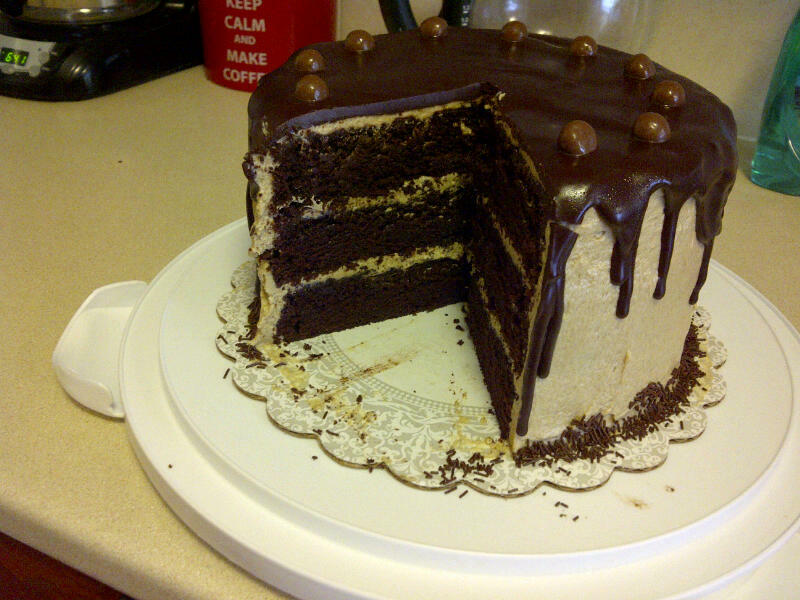 Earlier this year I made the Chocolate Coffee Cake with Dark Chocolate Ganache. And let me tell you, it was awesome. (I give total credit to the recipe and good ingredients) The cake went together so well and looked and tasted wonderful. Perhaps this is where that false confidence started to grow. Hmm. In the past few months, I've made two cakes. The first was the Root Beer Bundt Cake. Very interesting cake to make. I like the idea of a bundt cake, as it is so much quicker to put together than a 3 layer cake. I didn't get a strong taste of root beer in the cake. (the second day I could taste it a bit) And I got no taste of root beer in the icing at all, but that might have been because I actually drank the rest of the root beer rather than save it for the frosting. D'oh! (silly bundt) Other than not tasting like root beer, the icing was very nice and thick on top of the cake. (I used diet coke instead) The cake and icing was super chocolatey due to the Valrhona Cocoa Powder. (I highly recommend it if you've never tried it) The cake is definitely a keeper. I would make it again; perhaps for someone's birthday. Now this Caramel Apple Cake didn't turn out as well as I had hoped. I found that my buttercream didn't want to stay together. (for some reason the butter kept separating) Meh....what are ya gonna do? It still tasted good, but wasn`t up to my standards. Because the buttercream didn't take, the layers were a bit woobly. I was waiting for the cake layers to all slide away....but it didn't happen. This cake reminded me (in flavour) to the Spanish bar cakes we used to be able to buy in the grocery store. I will make it again one day and hopefully the buttercream gods will smile on me....but not a beaming smile that would melt my butter!! The cake was good. No, the cake was really good. The milk chocolate and peanut butter combo was divine. I think we might have a winner for hubbie's birthday cake. I know, I know, I should be letting him pick his favourite. And I will do my best to encourage him in my the right direction. Honestly, I'd be happy to bake any of these cakes for his birthday. Love you more than gum drops, honeybunny. Wow. Those are all great birthday cakes!